Caleb Brown earned an Hon. B.Sc. in Zoology and M.Sc. in Vertebrate Palaeontology from the University of Calgary. Caleb examined patterns of growth in the frill of centrosaurine (horned) dinosaurs. His M.Sc thesis studied the systematics of Thescelosaurus and other basal ornithopods dinosaurs from western Canada. Caleb completed his Ph.D. in the Evans lab in 2013. 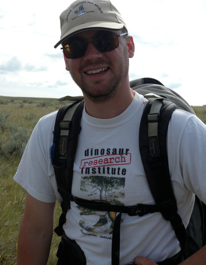 For his Ph.D research, he investigated population-level variation and evolutionary morphology in horned dinosaurs from Alberta, and quanitatively tested hypotheses of evolutionary mode (i.e., punctuated equilibrium) in dinosaurs for the first time. Caleb has extensive field experience in Alberta, Mongolia, China, and the Canadian sub-arctic. He is now a postdoctoral fellow at the Royal Tyrrell Museum in Alberta. Citation information available from Google Scholar Citations here. Larson, D., N. E. Campione, C. M. Brown, D. C. Evans, and M. J. Ryan. In Press. Hadrosauroid material from the Santonian Milk River Formation of southern Alberta, Canada. Proceeding of the International Hadrosaur Symposium. Brown, C. M., J. A. Arbour and D. Jackson. 2012. Testing of the effect of missing data estimation and distribution in morphometric multivariate data analyses. Systematic Biology. 61(6): p 941-954. Brown, C. M., H. Giacomini, N. E. Campione, L. O’Brien, M. Vavrek, and D. C. Evans. (In press). Ecological modelling, size distributions, and taphonomic size bias in dinosaur faunas: a comment on Codron et al., 2012. Biology Letters. Published online here. Brown, C. M., D. C. Evans, N. E. Campione, L. J. O’Brien, and D. A. Eberth (accepted). Evidence for Taphonomic Size Bias in a Model Mesozoic Terrestrial Alluvial-Paralic System. Palaeogeography, Palaeoclimatology, Palaeoecology. Ryan, M. J., D. C. Evans, P. J. Currie, C. M. Brown, and D. Brinkman. 2012. New neoceratopsian dinosaurs from the Late Cretaceous of southern Alberta. Cretaceous Research 35: 69-80. Available (subscription) here. Brown, C. M., C. A. Boyd, A. P. Russell. 2011. A new basal ornithopod dinosaur (Frenchman Formation, Saskatchewan, Canada) and its implications for late Maastrichtian ornithischian diversity in North America. Zoological Journal of the Linnaen Society. 163 p 1157-1198. Brown, C. M. and P. Druckenmiller. 2011. Basal Ornithopod (Ornithischia: Ornithopoda) Teeth from the Late Cretaceous Prince Creek Formation of Alaska. Canadian Journal of Earth Sciences. 48 p. 1342-1354. Schott R. K., D. C. Evans, M. B. Goodwin, J. R. Horner, C. M. Brown, and N. R. Longrich. 2011. Cranial Ontogeny in Stegoceras validum (Dinosauria: Pachycephalosauria): A Quantitative Model of Pachycephalosaur Dome Growth and Variation. PLoS ONE 6(6): e21092. doi:10.1371/journal.pone.0021092. Evans, D. C., C. M. Brown, M. J. Ryan, K. Tsogtbattar. 2011. Cranial ornamentation and ontogenetic status of Homalocephalae calathocercos (Ornithischia: Pachycephalosauria) from the Nemegt Formation, Mongolia. Journal of Vertebrate Paleontology. 31:1 p. 84-92. Boyd C. A., C. M. Brown, R. Scheetz and J. Clarke. 2009. Taxonomic revision of the basal neornithischian taxa Thescelosaurus and Bugenasaura. Journal of Vertebrate Paleontology. 29:3 p. 758-770. Brown C. M., A. P. Russell, and M. J. Ryan. 2009. Pattern and transition of surficial bone texture of the centrosaurine frill and their ontogenetic and taxonomic implications. Journal of Vertebrate Paleontology. 29:1 p. 132-141. O’Brien, L. J., C. M. Brown, and K. S. Brink. 2012. Canadian Paleontology Conference Proceedings No. 10. The Geological Association of Canada, Memorial University of Newfoundland, St. Johns. 80 p.
Brown C. M., D. C. Evans, N. E. Campione , L. J. O’Brien, and D. A. Eberth. 2012. The false rarity of small dinosaurs: evidence for taphonomic size bias in a model Mesozoic terrestrial alluvial-paralic system. Canadian Paleontology Conference Proceedings No. 10, p18-19. Sept 22, 2012. Toronto (poster) – Winner of best student poster prize.